Sunday, January 7, 2018 - David and Friends (Curt Langdon on sax, me on piano, and Brandon Dodge on drums) perform from 3:00 to 4:00 p.m. at Sierra Place Senior Living. Tuesday, January 9, 2018 - A combo from the Mile High Jazz Band (Derek Fong on sax, Wayne Theriault on trumpet, me on piano, Frank Iannetta on bass, and Brandon Dodge on drums) performs at Comma Coffee, 7:30 to 9:30 p.m.
Tuesday, January 30, 2018 - Mile High Jazz Band, Carson Middle School Jazz Band, and Carson High School Jazz Band present the Jazz Extravaganza at Carson City Community Center. Sunday, February 11, 2018 - My composition, "Like Water in the Desert," is given its premiere at Maricopa Lutheran Church in Maricopa, AZ. I attended the service at which it was premiered. Tuesday, February 13, 2018 - Mile High Jazz Band performs at Living the Good Life, 7:30 to 9:30 p.m.
Sunday, February 25, 2018 - I conduct the Carson City Symphony in a concert featuring guest cellist Steven Framil. The concert features guest cello soloist Stephen Framil playing Victor Herbert's Cello Concerto No. 2. The program also includes the "Karelia Suite" by Jean Sibelius, three "Slavonic Dances" by Antonin Dvorak, music from "Quadrophenia" by Pete Townshend, and "La Suerte de los Tontos" by Johnny Richards. Saturday, March 10, 2018 - I perform on tuba with the Carson Valley Pops Orchestra at CVIC Hall, Minden, NV, at 7:00 p.m.
Tuesday, March 13, 2018 - Mile High Jazz Band performs a "Jazz & Poetry" event at Comma Coffee, 7:30 to 9:30 p.m. The theme for the night is "Springboards." Sunday, March 25, 2018 - The California Pops Orchestra, under the direction of Kim Vanaas, performs two of the arrangements I wrote for harmonica player Tom Stryker, "Emily" and "Take the 'A' Train." 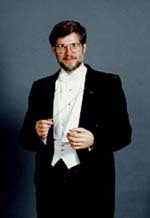 with Tom Stryker as soloist. The performance is at the Flint Center for the Performing Arts, Cupertino, CA, at 3:00 p.m.
Saturday, April 7, 2018 - "David and Friends" (Tom Stryker on harmonica, Don Smaltz on trombone, me on piano and trombone, George Worth on bass, and Lorrain Manatt on drums) perform from 2:00 to 4:00 p.m. at the Nevada Artists Assoc. Gallery in Carson City as part of the Downtown Business Assoc. Wine Walk. The group is sponsored by CCACC (Carson City Arts and Culture Coalition). Tuesday, April 10, 2018 - Mile High Jazz Band performs at Living the Good Life, 7:30 to 9:30 p.m.
Saturday, April 21, 2018 - I perform on tuba with the Carson Valley Pops Orchestra at Piper's Opera House in Virginia City at 3:00 p.m.
Sunday, April 29, 2018 - I conduct the Carson City Symphony in a concert featuring guest pianist Alexander Tutunov. He will perform Beethoven's Piano Concerto No. 3. The concert will showcase Symphony musicians Brian Fox, Concertmaster, and Eric Stern, Principal Violist (playing violin), in a performance of Vivaldi's Concerto for Two Violins in A minor. The program also includes Rossini's Semiramide Overture, and two movements from Elana Roussanova Lucas' Tatarian Dances (Harvest Dance and Wedding Dance). Tuesday, May 8, 2018 - Mile High Jazz Band performs "Merry May Jazz" at Living the Good Life, 7:30 to 9:30 p.m.
Sunday, May 27, 2018 - The Millennium Bugs (Jakki Ford on vocals, Derek Fong on sax, David Bugli on piano and trombone, George Worth on bass, and Brandon Dodge on drums) perform at the Tonopah (NV) Convention Center for Jim Butler Days 6:00 to 9:00 p.m.
Sunday, June 10, 2018 - I lead the Carson City Symphony in its thirty-fourth annual Pops Party concert which will be held at the Capital Amphitheater, between the Capitol and Legislature Buildings, starting at 6:00 p.m. The program features the Carson City Symphony, Carson City Symphony Chorus, and guest singer Cherie Shipley. The Symphony and the Symphony Chorus will perform pops music, music from musicals, films, and marches. Guest Conductor Carlos Rafael will lead the Symphony in selections from Leonard Bernstein's West Side Story. Bernstein would have been celebrating his 100th birthday in 2018. Among other things, the concert will feature music by Charles Strouse, composer of "Annie," who celebrated his 90th birthday on June 7. Admission is free. Tuesday, June 12, 2018 - I will lead the Mile High Jazz Band with vocalists Jakki Ford and June Joplin will be joined by six poets and readers for "Oh, Say Can You C?," a lively evening of big-band jazz music and poetry. The event will be from 7:30 to 9:30 p.m., in the courtyard adjacent to Comma Coffee, 312 S. Carson Street. The poems will be read by Rita Geil, Wayne Carlson, Krista Lukas, Susan Sara Priest, Timothy Rhodes, and Amy Roby. Some of the poems are originals by the readers. Each will be followed by a big-band tune that relates to the poem. Admission is $5, free for age 18 and under. Tuesday, June 19, 2018 - The US Navy 32nd Street Brass Band, Mile High Jazz Camp Band, and Mile High Jazz Band participate in a joint concert from 7:00 to 9:30 p.m. at Bob McFadden Plaza, 223 W. Third Street, Carson City. The Navy band, in Carson City during Navy Week, incorporates jazz, funk, Dixieland, and R&B, to keep everyone moving and entertained. The Mile High Jazz Camp Band, led by Nick Jacques, will open the concert. After a week of study with Jacques and a workshop with the 32nd Street Brass Band, these middle- and high-school musicians are eager to show their style. The Mile High Jazz Band with vocalist Jakki Ford will also perform, followed by all three bands combined for a rousing finale. Admission is free. Wednesday, July 4, 2018 - I play tuba will the Carson Valley Pops in a Fourth of July concert in Heritage Park, Gardnerville, NV. Free concert at 11:30 a.m.
Wednesday, July 4, 2018 - I conduct the Carson City Symphony and Chorus in a concert for the Genoa Americana Celebration in Mormon Station State Park, Genoa, NV. The Symphony performs at 4:30 p.m. Michael Langham conducts the Chorus in several pieces and Cheri Shipley is the featured vocalist. The event is free. Tuesday, July 10, 2018 - Mile High Jazz Band performs with vocalist Jakki Ford at Living the Good Life, 7:30 to 9:30 p.m.
Saturday, July 21, 2018 - I perform on piano with the Tahoe Dance Band for The Taste of Downtown event from 5:30 to 9:00 p.m. in front of the old Carson City Courthouse steps on the southwest corner of Carson and Musser Streets. August 3-19, 2018 - I am a major organizer of the Jazz & Beyond Carson City Music Festival. In 2018 we presented or featured more than 100 musicians in more than 50 events. Performers and events included (in no particular order) Batamba Collective (a percussion ensemble which is part of the World Percussion event on 8/9), CW Bayer, Carolyn Dolan, Mile High Jazz Band, Millennium Bugs, The Red Tango, Reno Jazz Orchestra, RoseBud's Dance Band, Sagebrush Rebels Band, Laurie Blue, Sierra Sweethearts, Brandon Dodge Quintet, Strings in the Summer (concert), Zack Teran Band, Niall McGuinness and the New World Jazz Project, The Jackie Landrum Band, Echoes Band, Fantods, Bayberry Cast, Me & Bobby McGee, The Other Brothers Band, Whiskey and Lemons, Alex "Muddy" Smith, Mylo McCormick, Tom Miller, Rocky Tatarelli Band, No Comprende, Retro Radio Dolls, Me & Bobby McGee, Dale Poune, Colin Ross and Frank Jones, Whiskey & Lemons, Reno Swing Set, CeCe Gable Trio, and Take This (featuring Cherie and John Shipley). In addition, as part of the Brewery Arts Center�s Levitt AMP series, several bands performed during the festival period! The Jukebox International Film Festival, sponsored by Wired Wednesday, followed at the end of Jazz & Beyond (Aug. 23 & 24). Two bands featured in the film festival also performed in the week after Jazz & Beyond. Saturday, August 4, 2018 - The Millennium Bugs (Derek Fong on sax, Don Smaltz on trombone, me on piano and trombone, George Worth on bass, and Brandon Dodge on drums) performed for the Carson City Historical Society's Annual Ice Cream Social in the Foreman-Roberts House Park in Carson City from 5:30 to 7:30 p.m. The event was free and was part of the Jazz & Beyond festival. Tuesday, August 14, 2018 - The Mile High Jazz Band performed in the Brewery Arts Center Ballroom from 7:30 to 9:30 p.m. The concert was originally scheduled to be at the Bob McFadden Plaza, but had to be moved to the Ballroom due to rain. The concert is part of the Jazz & Beyond Music Festival. Saturday, September 1, 2018 - "David and Friends" (Rocky Tatarelli on tenor sax, Don Smaltz on trombone, me on piano and trombone, George Worth on bass, and Dennis Steele on drums) perform from 2:00 to 4:00 p.m. at the Nevada Artists Assoc. Gallery in Carson City as part of the Downtown Business Assoc. Wine Walk. The group is sponsored by CCACC (Carson City Arts and Culture Coalition). Tuesday, September 11, 2018 - Mile High Jazz Band presented "Changing Colors" - An Evening of Big-Band Jazz and Poetry. The Mile High Jazz Band with vocalist Jakki Ford was joined by seven poets and readers for "Changing Colors," a lively evening of big-band jazz and poetry. The event was from 7:30 to 9:30 p.m. in the courtyard adjacent to Comma Coffee, 312 S. Carson Street. The poems, including some originals by the readers, were read by Rita Geil, Ursula Carlson, Wayne Carlson, Krista Lukas, Susan Sara Priest, Timothy Rhodes, and Amy Roby. Each reading will be followed by a big-band tune that relates to the poem. Saturday, October 6, 2018 - I perform with a combo at the NAA Gallery for the Wine Walk. Tuesday, October 9, 2018 - Mile High Jazz Band performs with vocalist Jakki Ford at Living the Good Life, 7:30 to 9:30 p.m.
Saturday, October 3, 2018 - I perform with the Carson Valley Pops on tuba. Sunday, October 9, 2018 - I conduct the opening event of the Carson City Symphony's 35th season with a concert, "Harmonica Gala," with harmonica soloists Jiayi He and Tom Stryker at the Carson City Community Center at 4:00 p.m. The concerts includes my arrangement of "Emily" for harmonica and orchestra and a three-harmonica arrangement with orchestra of "The Harmonica Player." I made my stage debut as a harmonica player on the third part of the latter. Tuesday, November 13, 2018 - Mile High Jazz Band performs with vocalist Jakki Ford at Living the Good Life, 7:30 to 9:30 p.m.
Saturday, December 1, 2018 - I play tuba with and MC the annual TUBACHRISTMAS event at the Wilbur D. May Museum in Reno, NV. The free concert begins at 3:00 p.m.
Saturday, December 8, 2018 - I play tuba with the Carson Valley Pops Orchestra in its Christmas concert at CVIC Hall in Minden, NV. The free concert is at 7:00 p.m.
Sunday, December 9, 2018 - I conduct the Carson City Symphony in the 35th Annual Holiday Treat Concert, 4:00 p.m. at the Carson City Community Center. Tuesday, December 11, 2018 - Mile High Jazz Band performs a jazz-and-poetry event, "Comfort & Joy," with vocalist Jakki Ford at Comma Coffee, 7:30 to 9:30 p.m.
Sunday, December 16, 2018 - I play piano for a Christmas party at a private home on the north end of Carson City at about 7:00 p.m. This is an annual event that I have provided music for over the last 4-5 years. Saturday, January 5, 2019 - The David & Friends jazz combo plays for the Wine Walk at the Nevada Artists Assoc. Gallery from 2:00 to 4:00 p.m. The event is free, but to participate in the Wine Walk, check the Wine Walk webpage at www.downtowncarson.org/this-months-wine-walk-stops. Sunday, January 6, 2019 - The Reno Philharmonic presents "Play for a Day." This is a chance for amateur musicians to play their instrument with with Reno Phil musicians, receive professional coaching from Reno Phil musicians, and play a concert with Maestro Laura Jackson. Among the works to be performed is my arrangement for full orchestra of "Home Means Nevada," Nevada's official state song. Other works by Bizet, Gounod, Sousa, Grieg, Elgar, and Rossini are on the program. Rehearsal is at 2:00 p.m. and performance is at 6:00 p.m., both at Billinghurst Middle School. For information, go to https://renophil.com/play-for-a-day. Saturday, February 2, 2019 - I perform on tuba with Zephyrus Brass Quintet in the Brewery Arts Center's Expresso Cafe from 2:00 to 4:00 p.m. This is part of the Carson City Downtown Business Assoc. 's Wine Walk, which goes from 1:00 to 5:00 p.m. The event is free, but to participate in the Wine Walk, check the Wine Walk webpage at www.downtowncarson.org/this-months-wine-walk-stops. Tuesday, February 12, 2019 - Mile High Jazz Band performs with vocalist Jakki Ford at Living the Good Life, 7:30 to 9:30 p.m.
Sunday, February 24, 2019 - I conduct the Carson City Symphony in "Balance & Nature," a concert featuring saxophonist Rhett Bender performing the premiere of the orchestral version of Carleton Macy's "Duality" for saxophone. Concert is at 4:00 p.m. at the Carson City Community Center. The concert also features Beethoven's Symphony No. 6 in F Major ("Pastorale") and Verdi's Overture to "Nabucco."